Dead Sea mineral-based scalp mask. Provides soothing hydration for the scalp, reduces scaling and irritations and softens the hair. Gentle texture, scented lightly with aromatic oils. 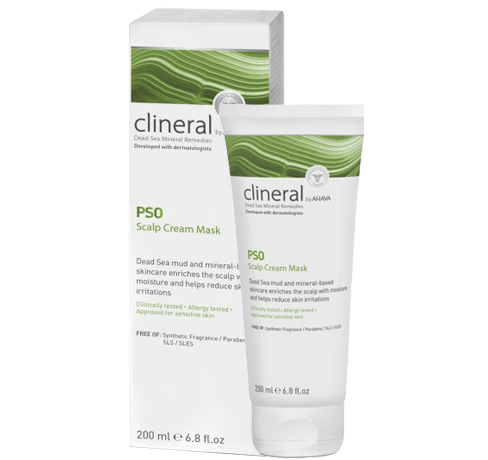 Usage: After washing hair with Clineral PSO Scalp Shampoo, apply sufficient amount of mask to scalp and massage thoroughly. Leave for 2-3 minutes and rinse well. Recommended to use this Mask every time hair is washed.Dead Sea mineral-based scalp mask. Provides soothing hydration for the scalp, reduces scaling and irritations and softens the hair. Very gentle texture, scented lightly with aromatic oils.